With our Winter Sale coming to an end, it only time we unveiled the first batch of brand new Spring Summer 2019 arrivals at Apache. Our three biggest brands — Lyle and Scott, Fred Perry and Farah — all feature prominently. As well as new T-Shirts, polo shirts and sweatshirts, we also have a brand new wash from Diesel Jeans for your consideration. These eye-catching raglan T-shirts stand out from the crowd with their sublime pique cotton weave. It feels different from all our other T-shirts — just that little bit softer, with a “honeycomb” fabric that is supremely comfortable to wear. Choose from three stripe styles in Navy, Pink Shadow and White. A similar style from Lyle and Scott is this block stripe T-shirt. Made from a classic 100% jersey cotton, the garment is made from cut and sewn panels — a mark of real quality and craftsmanship. 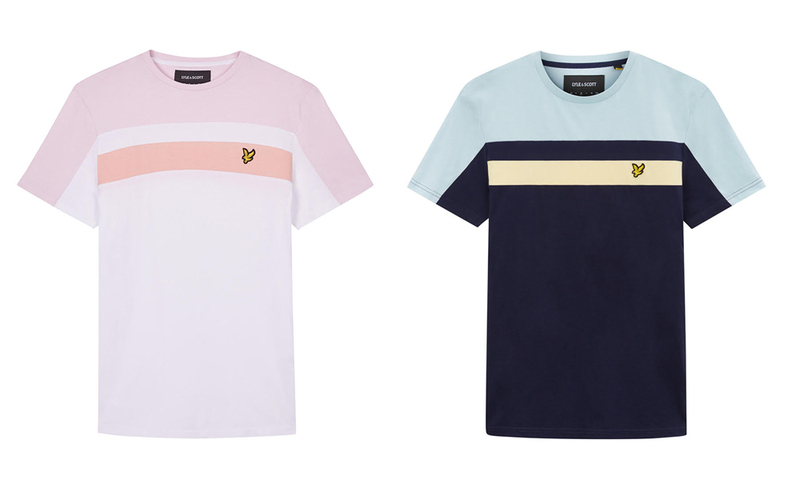 Perfect for a base layer in the colder months, this Spring Summer 2019 T-shirt comes into its own in summer, especially the White version with pink features. Perhaps the ultimate Apache garment, the Fred Perry Twin Tipped polo will be worn by our loyal customers until the end of time! This SS19 season, we welcome five early colours into the M3600 collection, from a classic Sky Blue with white twin tipping (Middle) to a bold Claret version (Left.) As ever, it’s made with a soft pique cotton synonymous with Fred Perry polos. Italian denim maestros Diesel return for Spring Summer 2019 with a brand new Black-Grey wash in their hugely popular Buster fit. Our customers love the comfortable slim tapered fit; not too tight to be considered skinny, but tapered enough to separate it from a classic straight cut jean. Sporty guys in particular like the generous cut around the thighs, tapering gradually to the ankle. Browse the full Diesel jeans range here. Farah can always be relied upon to reinvent a classic. 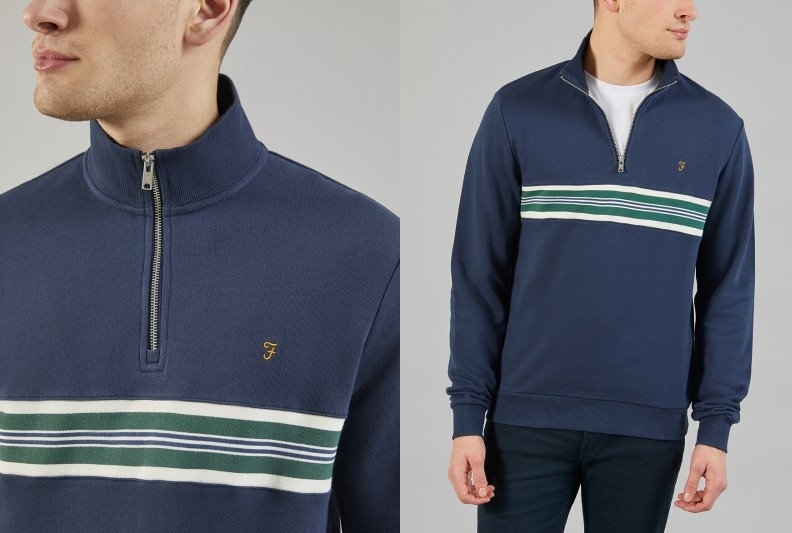 Using an on-trend quarter-zip design, Farah blends a classic navy colour with a unique stripe pattern to memorable effect. The sweatshirt boasts loopback cotton interior, for maximum comfort and breathability, making this sweatshirt the perfect second layer for any outfit. The funnel neck design will keep the elements away in style and compliments the quarter-zip style. Check out this humdinger of a T-shirt by Farah! 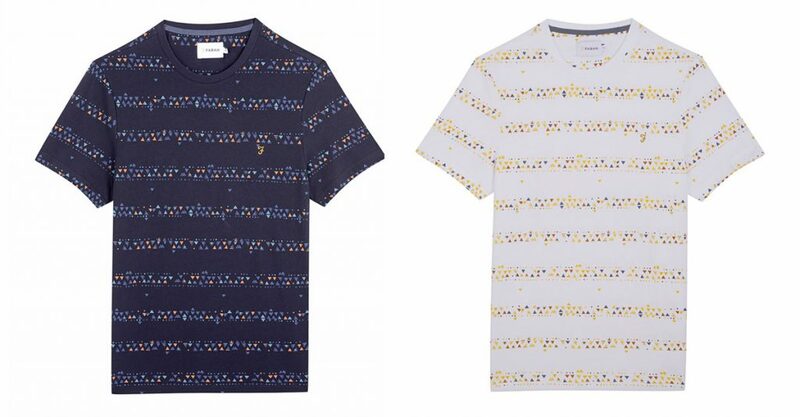 Using hundreds of micro triangles to form a stunning stripe pattern, both the Navy and White T-shirts will be a wardrobe highlight for years to come. Farah’s signature semi-slim fit is marginally snugger than Lyle and Scott or Fred Perry and remains very popular with customers of all shapes and sizes.